Looking for an affordable delay and looper device that can handle all of the usual demands as well as a lot more then the Electro Harmonix Canyon pedal should definitely be on your must seriously look at list. Electro Harmonix are well established and known for producing great pedals but there is a lot of competition out there, so how does this beauty it stack up? The Electro Harmonix Canyon Delay & Looper Pedal is a delay and looper pedal featuring 11 modes with a tap tempo control and tails switch. The Canyon is packed with power and a huge array of playing options to help you unleash your creativity. With a built-in looper (for up to 62 seconds of playback), this pedal contains pristine digital delay to warm and warbly tape echo, reverse and modulated delays, cascading octave delay and shimmer. There are ten different effects in all plus a fully featured looper. Internal or external Tap Tempo with tap divide and a variety of secondary knob controls combine to produce a truly grand Canyon experience. As the box says, Electro-Harmonix’s Canyon is a delay/looper, but it goes the extra mile, packing a wide repertoire of delay effects into its compact pedal format. You might have met some of them before but others could only have been dreamed up while under the influence of EHX Founder Mike Matthews’ cigar smoke! 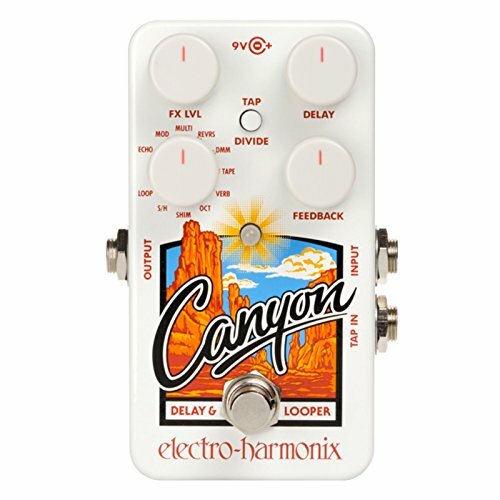 Outwardly, the Canyon looks fairly conventional: there are self-explanatory effect level, delay time and feedback knobs. A fourth knob selects the effect type, while a Tap/Divide button, which nestles between the knobs, is for setting tempo-related effects. This switch cycles through three subdivision settings, and the LED indicates the selected option: it’s red for quarter notes or no division, orange indicates dotted eighth notes, and green denotes eighth notes. The power inlet is on the top edge of the case and a PSU is included. An internal switch determines whether or not the decay tails continue when the effect is bypassed, and there’s a third jack to accommodate a normally open footswitch for inputting tempo, as an alternative to using the main foot switch. For most modes, further hidden functions can be accessed: you first press and hold the Tap/Divide switch for times longer than one second, then use the delay and feedback knobs. The functions that can be accessed depend on which effect mode is selected (the secondary functions don’t apply in looper mode), and changes are saved for that particular effect, even after powering off the unit. Some typical secondary functions are mod rate and depth for the mod delay, wow and flutter for the tape delay, and modulation for the Deluxe Memory Man mode. The delay time can be set from just 5ms up to a monstrous 3s, and the looper function can record up to a minute. In addition to the looper, there are 10 effect types on offer. In the more-or-less conventional delays category we have Echo, which is a typical digital delay; Mod, which adds pitch modulation; DMM, which emulates an EHX Deluxe Memory Man; and Tape. Multi, which generates a multi-tap delay — but not as we know it. Here, the repeats are all at the same volume, and the feedback knob sets how many repeats will occur. Verb adds a plate-style reverb to the delays. Shimmer Verb shifts the delayed signal up an octave, while also adding modulation and compression to create an etherial strings-meet-organ effect. Oct shifts each successive delay repeat up by a further octave, and if you use the alt knob function you can add a sub-octave too. Reverse handles the now familiar trick of delaying a section of sound, then playing it back in reverse, which is very psychedelic. S/H stands for Sample & Hold and is triggered by the input signal — pluck a note and it’s repeated at the same volume until another note is played to replace it. The feedback control adjusts the trigger sensitivity in this mode. To record a loop, press the footswitch — the LED turns red and recording starts right away. Pressing the switch again stops recording and the LED turns green. In this mode the effect level control adjusts the loop level, while the input is always passed through at unity gain. Overdubs can be added with the loop playing by pressing the switch again, turning the LED orange. Feedback sets how much or how little of the previous loop is retained as you record the new layer. You can get into a lot of trouble using loopers live —so thankfully the footswitch can be pressed and held to activate undo and redo functions. Unusually for a budget pedal, the recorded loop is saved when the unit is powered off. If you want to use only the external footswitch for setting the tempo you can disable the tempo function of the unit’s own footswitch by holding it down while you connect the power. The main benefit of this is that it allows you to turn effects on and off quickly without accidentally changing the tempo. On the whole, I have to say that the Canyon does exactly what it sets out to do and does it very well. The looper is basic but it does the job. I’m a sucker for the Shimmer and reverse delays, but all the regular delay offerings sound as they should too, with the Deluxe Memory Man setting being particularly welcome. Having access to more detailed adjustment via the two alternate knob functions is also a bonus, not least as your custom changes are saved for next time you call up that preset. I’m not entirely sure where I’d personally use the Multi and S/H delays, though they certainly offer something a little out of the ordinary for those who like to be more experimental. So, if you’re after one affordable delay device that can handle all the usual functions and then some, the Canyon already has much to commend it — and then there’s the looper to consider! WHAT DO TWITTER USERS THINK?